Whilst I might not have adored Ari and Dante as much as some other people, I still really loved it - devouring it in one sitting on my sofa. 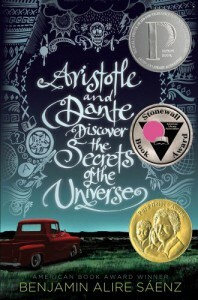 I loved the lyrical prose of this novel, and the growth of the relationship between Ari and Dante. Ari is hiding his feelings from himself so well that it comes almost (but not quite) as a surprise when he finally admits how much he has come to care for Dante. Ari was a puzzle. I think he was very confused and in a lot of pain (both physical and emotional), but he could also be a bit irritating (just like anyone, I guess). Dante, on the other hand was a cute little shite and I wanted to jump into these pages and smother him with love. I will definitely be one of those people that say: omg you have to read Ari and Dante!